Today’s pic takes another look at the McCloud episode “Fifth Man in a String Quartet,” first airing on February 2, 1972. 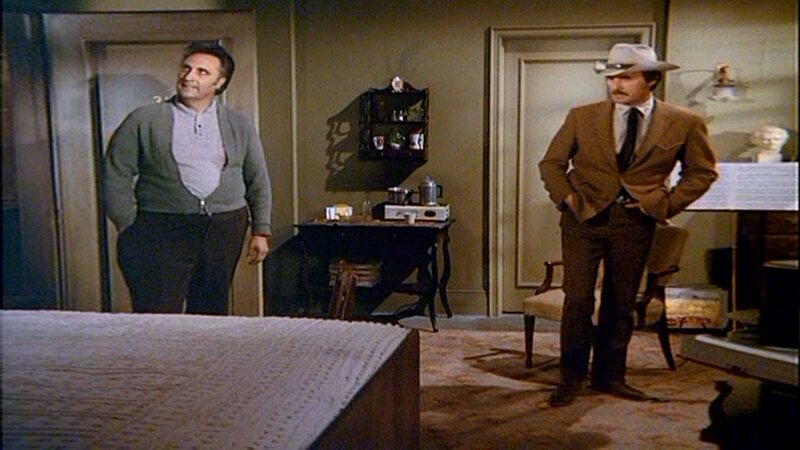 Timothy’s unnamed apartment super shows McCloud (Dennis Weaver) around the apartment of a musician accused of murder. Tim definitely was at his heaviest in the early 1970s. It’s hard to believe that by the end of the decade, he would be as thin as a reed again. From what I’ve gleaned from the family, he certainly liked to eat! He was especially fond of Chinese and Mexican food. This entry was posted in Television and tagged dennis weaver, fifth man in a string quartet, mccloud, timothy carey. Bookmark the permalink.